Conquip Engineering Group are UK market leading, UK based, specialist manufacturer of crane and forklift attachments. Many years of working with clients across a wide variety of industries has given us an unrivalled knowledge of the intricacies that face operatives and engineers in each sector, we use this knowledge to bring market leading products and solutions, we are, POWERED BY KNOWLEDGE. 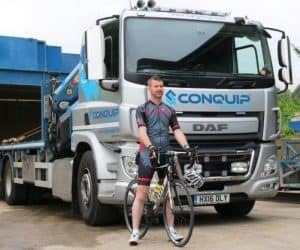 Conquip Engineering Group have always striven to evolve the products and solutions we offer with full emphasis on Health & Safety. Working closely with clients across the industry we have been researching procedures and photographing or filming operational processes to identify areas in which we can improve safety for the operators of our equipment. Oliver Leavey, our Head of Operations is our elected Fuel and Emissions Campion and he explains how important FORS is to our Company. We take compliance and safety very seriously. FORS did help us by providing training and tools that improved the policies and procedures. The performance management toolkit really helped us set our targets for reducing our carbon footprint and improving our MPG which has increased by 17.49% since our baseline year. FORS has helped us improve our filing systems and procedures as well. We have improved our MPG across the whole fleet by 17.49% compared to our baseline year. We achieved this by making sure we always selected the best route possible to all our sites and we plan ahead before leaving the yard. We have adopted a recruitment policy but we have used a recruitment agency for the past 9 years to help us employ young drivers and train them up to be able to drive our Class 2 or Class 1 vehicles once they have passed your their Driver CPC courses. We only have 1 Operators yard and it’s in an Industrial Estate. We don’t carry out any work at our site, we only use this site for parking our Vehicles. Servicing is done by main dealers at their premises and as we are only move our own goods we go to a site, collect a load there and then drop it off at our yard. We use gas fork lifts to try and reduce the noise made and its more environmentally friendly. All our vehicles are fitted with White Noise Reversing alarms. We carry heavy equipment and products to and from construction sites across the whole country. We move anything from a pallet to plant equipment. As we rely on our customers asking us to deliver and collect equipment from various construction sites across the whole country, we never know where we are going until they need us. We went to the Scania Offices in Stockholm for a 2 day stay in Sodertalje which is the home of the Scania factory and test centre, the purpose of the trip was to understand the current megatrends and how this affects the transports industry. This was also the launch of Scania’s latest Vehicle, the L series (low entry urban delivery vehicle), offering a 5 star rating against the direct vision standard. There was also workshops to investigate alternative fuels (HVO, Bio Gas, Compressed Natural Gas, Bio Diesel), all vehicles available to test over the weekend ran on alternative fuels. Although not yet commercially viable we have identified HVO as being the best solution for Conquip’s application, we will continue to monitor the market with intentions to move to this fuel as and when it becomes viable. Scania’s L series has been identified as a replacement for some of our current delivery vehicles and they will be added to our fleet in the next 12-18 months, these will give us greater visibility and in turn make it safer for vulnerable road users. We can’t afford to try and move anything via barge or train as we collect all the equipment from building sites and there is no other method than using a lorry and we then asked to deliver anywhere in the country. So using a Lorry is the most cost effective way of moving our own goods. We are replacing all our lorries with Euro 6 engines as and when they are due for replacement. We have looked at electric vehicles and because of the weights we carry and the fact that our lorries have specialist equipment fitted no manufacture have produced an alternative fuelled vehicle that can carry the weight we do and go over the same terrain we do. Even when we looked at vans, the distance we travel to and from London we couldn’t make it a viable option. We will continue using what FORS has taught us to improve our MPG and reduce any wasted idling we might have and keep our Parking fines and Charges as low as possible. Gaining FORS Gold Accreditation shows how dedicated we are as a company to improving road safety and the safety of all vulnerable road users in London as well as nationally. We will continuously use what FORS has taught us to help reduce our carbon footprint and make the roads so safer for everyone that uses them. We have also managed to make a significant saving by reducing our fuel usage and improving our MPG. 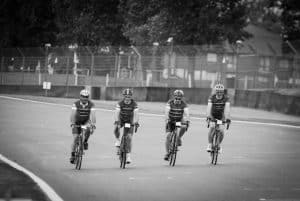 We also helped arrange and take part in Revovle24 last year, Revolve24 is an exciting new series of Endurance Cycling Challenges with signature 24hour event the centrepiece of sporting and charitable endeavour. Revovle24’s ultimate aim is to provide inspiring, extraordinary and affordable cycle relay events around the world on Iconic Motor Circuits.